Scooters can be easily be set to go slower or faster based on the user or terrain. 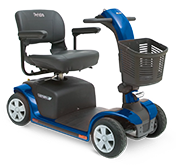 *Top speeds are based on a full battery charge, flat surface and standard user weight. The turning radius is the minimal space needed to execute a 180° "U-turn". If you plan to use your scooter indoors or in tight spaces, make sure to choose one with a low turning radius! If you plan to disassemble your scooter for transport, make sure you or your caregiver can safely lift the heaviest piece. Not all scooters are easily disassembled. Consider purchasing a vehicle lift so you can transport your fully assembled scooter. Your battery range is how far you can go on one full charge. If you drive all over town, this is an important feature to consider so you don't end up stranded. *Battery Range is based on a full battery charge, flat smooth surfaces and standard user weight. A scooter with a delta tiller can be operated with only one hand and has feather light forward and reverse controls. The padded, wraparound portion offers a comfortable place to rest your wrists while driving. Ground clearance greatly affects your ability to clear door thresholds and uneven outdoor terrain. If your thresholds are extra tall you may need a threshold ramp. The maximum incline rating is important if you need to climb steep slopes or ramps. It is extra important for those who live in hilly terrain. Some scooters can easily be disassembled into serveral small, lightweight pieces so that they fit easily in a vehicle for easy transport. If you are sitting in your scooter for long periods of time, selecting a seat that is a comfortable width for your body is important. Select a seat width that is at least equal to or greater than the widest part of your hips. Most seat heights can be adjusted, but knowing the max seat height can be beneficial to taller users. A power-elevating seat will typically give you an additional 3" to 6" in seat height. These extra inches can be helpful to reach upper cabinets and higher counters. Learn about how to decide which product is best for you and how to care for it. How do travel and non-travel units differ? A travel scooter can be quickly disassembled into 4-5 pieces to be loaded into a vehicle. If you can lift a few gallons of milk then you can lift the heaviest piece of a travel scooter. Full-Size units are best for those who prefer a full featured scooter. These scooters have high ground clearances, faster speeds and longer battery ranges. Like the name suggests, these scooters feature a 3-wheel design and come with the capability to be easily transported for on-the-go users. 3-wheel travel scooters typically disassemble into four pieces, with the lightest piece weighing as low as 22 pounds for some models. These scooters are easily stored in the back of a car for use around town and the sealed batteries allow for transport on a plane. 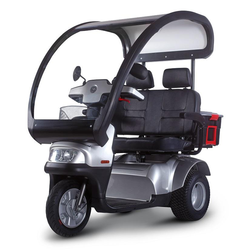 Because of the 3-wheeled design, these mobility scooters feature a better turning radius, allowing for more maneuverability around small spaces. Since these are more compact scooters, these scooters are not recommended for users above 5’10” or 300 pounds. Similar to the 3-wheel versions, these 4-wheel travel scooters disassemble for easy transport, with the heaviest piece weighing as low as 29 pounds. 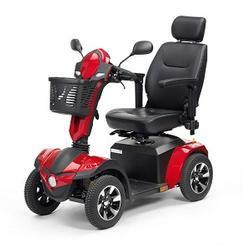 Though these scooters are lightweight and easily transportable, the 4-wheel design offers added stability while driving around your home or the mall. Like their 3-wheeled counterparts, 4-wheel travel scooters have sealed batteries, so they can be used on an airplane. Like a “big brother” to travel scooters, these 3-wheel full size scooters have more features and power. With the comfort and durability of a full size scooter, these scooters pack a punch while providing the ease of maneuverability that a 3-wheel scooter offers. 3-wheel scooters are great for outdoor use, with smaller models able to maneuver around indoors with ease. Unlike their travel counterparts, many of these full size scooters have a higher weight capacity. These scooters may require a vehicle lift to transport. For users who want the same durability featured in the 3-wheel full size models, but also want maximum stability, a 4-wheel full size scooter is the perfect option. These scooters are great for outdoor use, with a higher ground clearance and larger tires, which can accommodate uneven terrain and wide, open spaces. Because of the larger design, the turning radius for 4-wheel scooters is greater, making some harder to maneuver around tight spaces indoors. For added durability and power, Spinlife’s selection of heavy duty/high weight capacity scooters has just what you need. 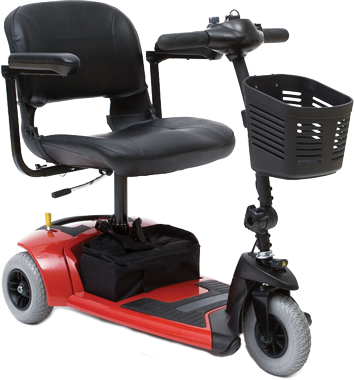 With weight capacities of up to 500 pounds, these scooters accommodate a wider range of users and needs. Heavy duty/high weight capacity scooters can be 3-wheeled, for ease with maneuverability and 4-wheeled, for a more stable ride. Lighter than most travel scooters, folding scooters are a convenient option to stay mobile. Many models fold within seconds and are easily inserted into the back of a car, with some models having the ability to be pulled like luggage. Folding scooters are ideal for second scooters, and are narrow enough for smaller spaces. For users that lead an active life outside, all-terrain scooters are the perfect option to achieve maximum independence. Featuring a higher ground clearance and larger wheels, all-terrain scooters can handle your active lifestyle. Combine these features with added driving range, higher speed and the stability of a wider drive base and you have a scooter that can take on almost anything. Recreational scooters are fun, fast, and built to perform. If you need to get from one place to another and you're looking for a scooter to add convenience to your routine, recreational scooters are a great option. With eye-catching colors, plenty of storage, options for personalization, and longer driving ranges, you're sure to find a scooter to fit your needs and your personality. Need room for two? Here’s you’ll find a selection of scooters made to fit two people. Most scooters can also be equipped to carry groceries or cargo. Look for "Dual Seat" or "Extra Wide" seat options in the product listings. Spinlife has the right accessories to add to any scooter. We feature quality accessories for a variety of needs. Whether you need new batteries, baskets for the front and back of your scooter or covers to protect your scooter from the elements, we have it. Whether you need to replace an existing battery or you are picking up a spare for added drive range, Spinlife has you covered. We offer a wide selection of replacement batteries and chargers to ensure your scooter has the power it needs to maintain your mobility and independence. 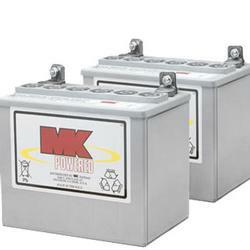 Most batteries are airport approved and safe for travel, ensuring you can go where you need to. Mobility Scooters are the ideal solution for people who need a little help getting around, and there is a great mobility scooter to meet every need. From folding and travel mobility scooters, to full size and all-terrain mobility scooters, we can help you find the one that is perfect for you. 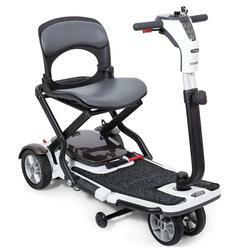 Looking for mobility scooter reviews? 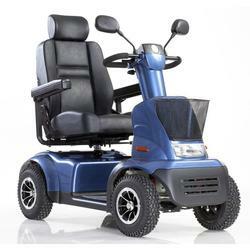 We have thousands of reviews on top brands such as Pride Mobility, Golden, and Drive Scooters. Just click into any product to see what others have to say. Have questions about which scooter is right for you? We have answers! Visit SpinLife University or call our Product Experts today. SpinLife offers the widest selection of electric mobility scooters for sale. Our great selection means we can help you get the right motorized scooter for your needs. Visit our knowledge center, SpinLife University, or read the following basic overview. These are just what their name implies, ready to get you on the road. Models in this category disassemble for easy transport in the trunk of most cars. Travel scooters are easy to lift into the trunk, with the heaviest piece on some models weighing as little as 22 pounds. Sealed batteries make them airline safe. As you might imagine, these travel scooters are compact so we don't recommend them for people over 5'10" or 300 pounds. Some great choices include Invacare scooters and Pride scooters. A step up in size and features from the travel scooters, these scooters offer full-sized comfort with three-wheeled maneuverability. They are the perfect choice if your mobility needs demand a scooter that you can use both indoors and out. 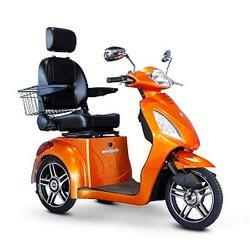 With weight capacities up to 350 pounds and available features like power-elevating seats, there is a scooter for most everybody in this category. 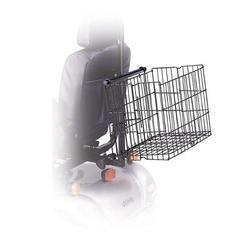 We carry all the top manufacturer brands including Golden and Pride scooters. If you weigh over 350 pounds, these are the mobility scooters for you. With both 3 and 4-wheeled models to choose from, and with weight capacities up to 500 pounds, there is sure to be a heavy duty scooter that meets your needs. Can I take my scooter on an airplane? All mobility scooters sold at SpinLife have batteries that are "maintenance free" and are allowed on airlines. SpinLife advises that regardless of your maintenance free battery type ("gel cell" or "sealed lead acid") that you check with the airline directly to get their approval. SpinLife is here to support you throughout the life of your equipment and this includes helping you with any problems that may arise after you receive your scooter. Please contact us directly at 1-800-850-0335 and we will attempt to troubleshoot it over the phone. Many times, it is the flip of a switch or reconnecting a wire to help you get on your way again. 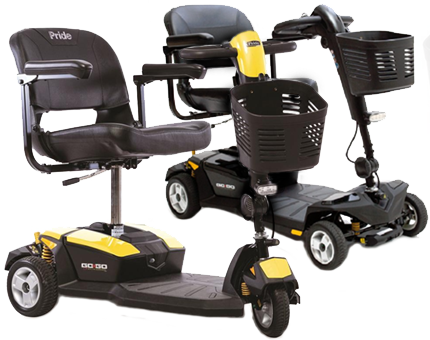 If we are not successful with that, or it indicates a bigger problem, we will arrange for a service technician to come to your home (only available on Pride, Invacare, Golden Technologies and select ActiveCare scooters). If you have a scooter by a different manufacturer, we will contact the manufacturer to obtain warranty parts and have them shipped to your home. What happens if I want to return my mobility scooter? If your motorized scooter arrives and it is not what you expected or needed, you can return it within 30 days as long as it is unused (tires are clean and no scratches) and in its original packaging. On all units, the customer is financially responsible for freight charges. If the scooter arrives damaged or is not what you ordered, SpinLife will arrange for freight and for shipping you an undamaged or corrected unit. Please see our Return Policy for details.